Many great players hit the free agent market during 2014 offseason, to speculate that this year’s offseason could possess the same activity would seem ridiculous to some. But this past week has been mind boggling for most as we see players shift from team to team and rosters make their best effort to build their teams prior to the draft. Indianapolis Colts: With one of the building blocks of the franchise in limbo, Reggie Wayne, the Colts were aggressive in adding talent to be added amongst the AFC’s elite. Signing vets like Andre Johnson, Trent Cole and Frank Gore, Indy has put together the essentials for Andrew Luck to succeed. Also reassuring their secondary to keeping defensive backs Darius Butler and Mike Adams are in line to dethrone New England. Seattle Seahawks: After having repeated issues in the Red Zone and infamous no call to Marshawn Lynch, the two time NFC champs added more weapons to their offense by trading for the dominating Jimmy Graham. Resigning Lynch and adding Graham give Russell Wilson a greater opportunity to expand his game. Seattle did lose one of its best defenders in Byron Maxwell but have added a great corner in Cary Williams to replace in the Legion of Boom. New York Jets: Giving up 234 passing yards per game, the Jets went back to their winning formula shown in the past and brought back the tandem of Darrell Revis and Antonio Cromartie to fill the void. Along with “Batman and Robin”, they added defense backs Buster Skrine and Marcus Gilchrist to add to their poor secondary. The offensive side of the ball improved for the Jets as they acquired big time receiver Brandon Marshall, and bolstered up the offensive line by re-signing Willie Colon and adding James Carpenter from the Seahawks. San Francisco 49ers: After having some the best years under Harbaugh regime, the Niners are headed toward darker days once again. 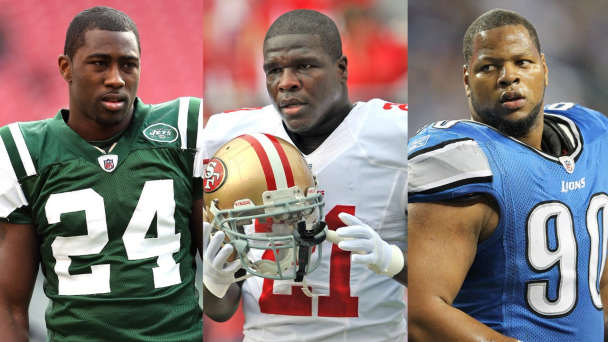 The retirement of defensive leader Patrick Willis and Justin Smith was just the beginning, following the loss of workhorse Frank Gore and Michael Crabtree up for grabs there are a lot of holes to be filled for the once powerhouse of the NFC. New Orleans Saints: The loss of Jimmy Graham, Kenny Stills will have a detrimental effect of Drew Brees efficiency this season and give “Who Dat” nation a lot to worry about. The offense targets departing will have to shoulder a load on their full house of running backs that added C.J. Spiller. It will be tough for the Saints to rebound following the losses suffered. I see a lot of moves have been made these last few days in the NFL. Some good and some arguably bad pickups for teams. However my question is based on the transactions of players in this article, who do you feel has made the smartest moves toward bringing a Super Bowl title back to they’re city for the 2015 season? In my opinion, you look at a team like Indy, who brings in Johnson and Gore and surround him around the best young QB in the league and add veteran leadership on the defensive end as well with Trent Cole, they were one game away from the SB last year and could potentially be there next year.